Product code: T708 Categories: Art Deco, Art Deco Rings & Art Deco Engagement Rings. There is something so magical about an engagement ring from the 1920’s and this hand made platinum 1920’s Art Deco diamond engagement ring is certainly no exception. So beautifully designed and made, platinum was often used during the Art Deco period as it is the purest of all precious metals used in jewellery, retains its pure white colour and allows the jeweller to do very precise and fine work that cannot be achieved with gold. with four angular “corners”. The surrounding this in a square shape are four sides each set with three single cut diamonds. This top square section measures 10mm in diameter and then on each side is the most elegant step design. With each side set with three, two then one single cut diamond, the proportions of this ring make it stand out so beautifully on the finger. From one side across to the other, this distance measures 20 mm across. The centre diamond measures 0.71 carats and is F in colour and Si in clarity and the additional twenty four diamonds total 0.72 carats and the sparkle from this ring is just wonderful and destined to always make this ring get the attention and admiration it deserves. 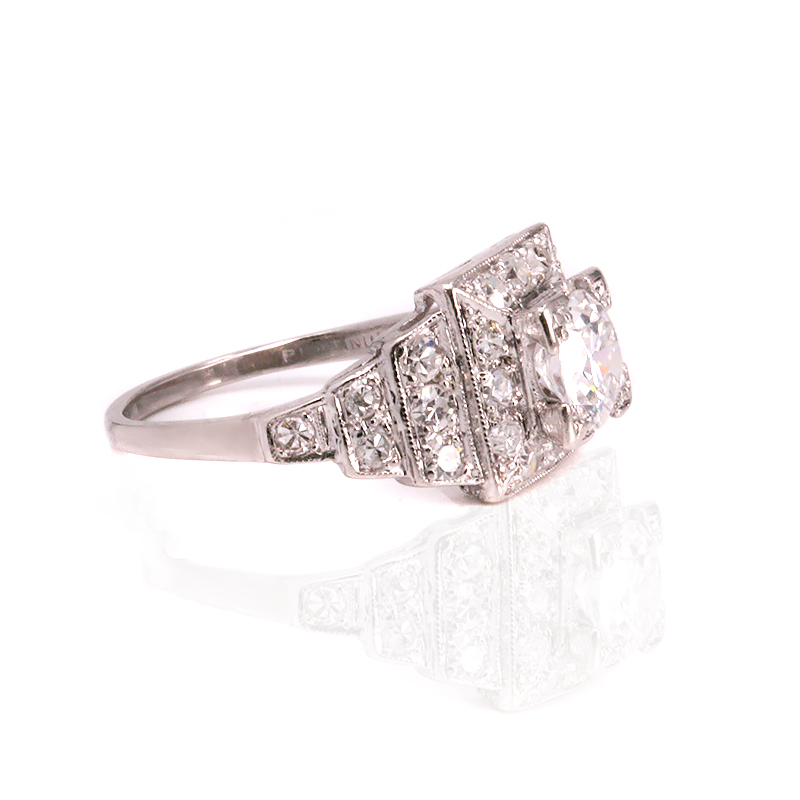 With a wonderful style, this 1920’s Art Deco diamond engagement ring is just perfect. 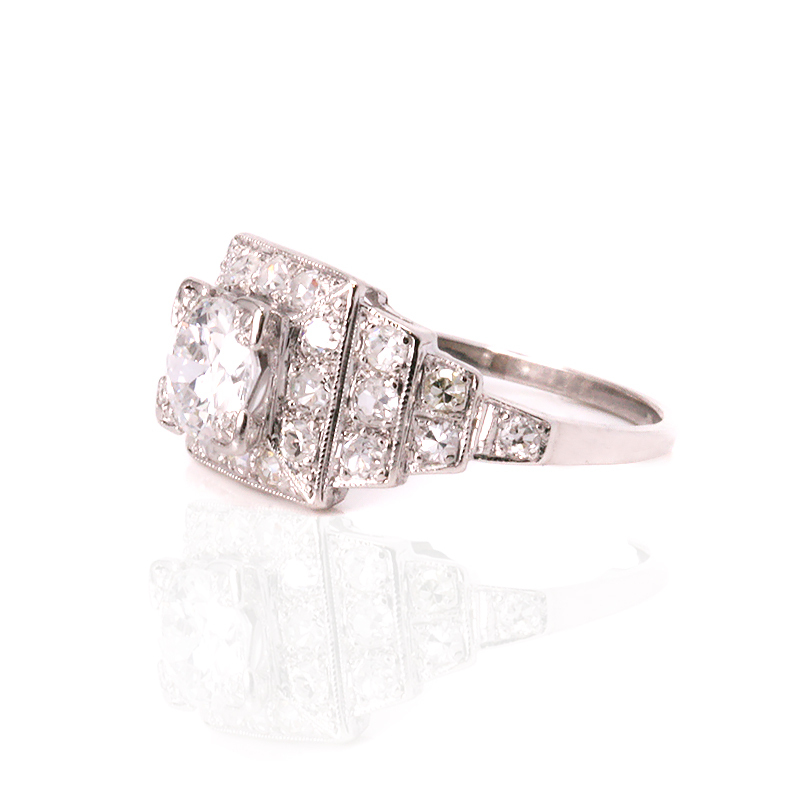 Art Deco engagement rings from the 1920’s to the 1940’s have remained as popular today as when they were made. Because of this, they remain the most popular era for engagement rings. With many made in either platinum or a combination of gold and platinum, being hand made makes them so much stronger than mass produced cast made rings and also so much more unique. 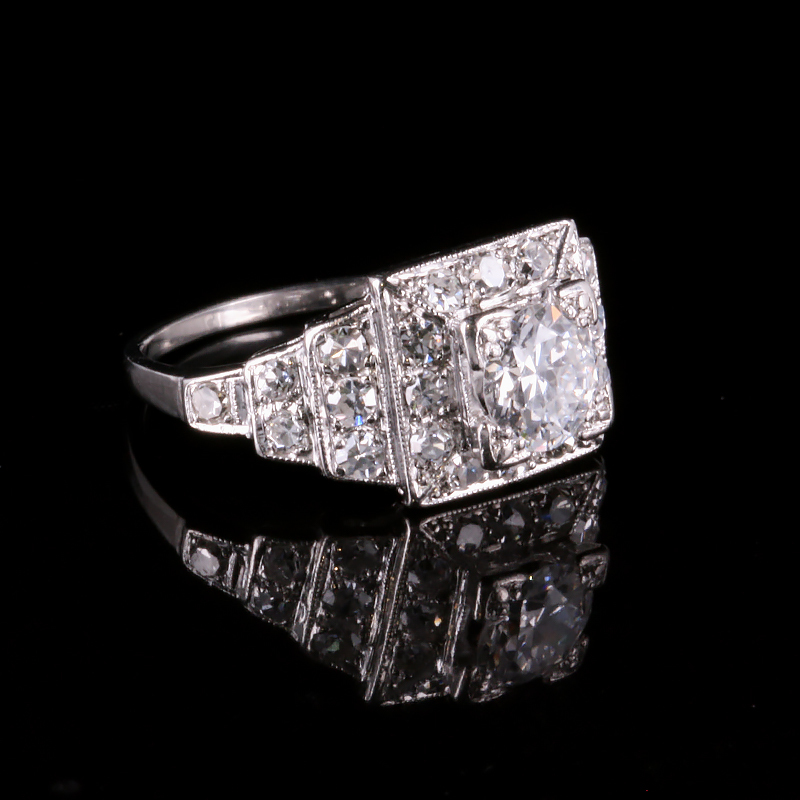 There really is nothing quite like a genuine Art Deco diamond engagement ring to adorn your finger forever.